Prospective home owners who desire ultimate community lifestyle with contemporary luxury living are in for a good deal, following the development of Blue Water House Lagos, a sprawling four-hectare residential estate located on Goshen Road, Off Remi Olowude Street, Lekki Phase 1, Lagos. The mixed development project comprising five blocks of 17 to 20 floor-high rise residential buildings made up of one, two, and three-bedroom contemporary luxury apartments, and each block sitting on 37,000 square metres of sea view land, and consists of 10,000 square metres retail and leisure mall, 10,514.76 square metres of built up area for Phase 1. 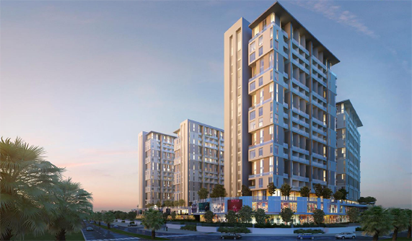 The multi-billion naira project being developed by Messrs Elalan Construction Company Ltd and African Capital Alliance, ACA, consists of 600 apartments in all. Elalan is one of the fastest growing and most dynamic construction and civil engineering companies in Nigeria. Over the past three decades, the company has successfully delivered a multitude of project spanning a broad range of asset classes including No. 4 Bourdillon, Tango Towers, Olympic Towers, and WAPIC Head Office, Lagos. African Capital Alliance is a leading pan-African investment firm sponsoring funds and managing investments of over $1.2 billion. Founded in 1997, ACA is an independent private equity firm focused on investing in Nigeria and the Gulf of Guinea. It has raised aggregate commitments of over US$1.2 billion since its inception and has a track record of successfully exiting investments and delivering strong returns to investors. Targeting single and upwardly mobile individuals, first home buyers, couples, second home seekers looking for proximity to their workplace, smart property investors, retirees downsizing their housing needs and Nigerians in diaspora seeking serviced and secure housing as they transit back home, the project which comprises contemporary luxury apartments, exclusive residents’ recreational park, internationally branded retail and leisure mall, and waterfront living, will suit the purpose of the residents, according to Mr. Kenneth Leech of Elalan Construction Company during the topping out ceremony of the Phase 1 of the project last week. Describing the project that commenced July 2018, as the best in its class in Lagos, Leech said besides the fact that the residential estate comprises luxury apartments, it is a secured community with recreational entertainment and leisure facilities. He noted that residents and ensuite shower, fully fitted air-conditioned kitchens, contemporary bathrooms with quality fixtures and fittings, beautiful ceramic tile flooring, energy efficient appliances, private and service balconies and internet and cable TV wiring connections. Describing the project as innovative, Leech said it comprises energy and water efficient systems, fire alarm and sprinkler protection, water and sewage treatment plants and high speed broadband service, pointing out that as waterfront living, occupants will experience beautiful views of the sea, harmonic waves and soothing breeze. On public response to the project, Mr. Obi Nwogugu of African Capital Alliance, said market response is very good and encouraging, adding that 35 per cent of Phase 1 is already committed. We said: “We are happy with sales so far,” describing investment in the project as safe with significant capital appreciation even before construction is completed and good rental yield based on excellent location for rental investments. The prices of the apartments are: One bed-room from N41.5m, two-bedroom starting from N54.8m, and three-bedroom starting from N81.2m. Infrastructure deposit for one bed-room is N1.5m, two-bedroom is N2.125m and three-bedroom is N3.0m, while Legal & Administration Fee is N400,000.00 per apartment. Payment plan includes 20 per cent down payment, balance paid in equal quarterly instalment payments over the construction period before December 2019.